Enjoy an exciting afternoon that’s exclusively reserved for you, your friends and family at our world-renowned education and research facility. Your adventure begins with a personal tour by our friendly staff and introductions to our bottlenose dolphins and sea lions. Each member of the family has a unique story and personality and you’ll get to know them all! Are you interested in our cognition research, how we train and work with them each day, or how we provide their excellent care? Pick a topic and we’ll customize a narrated behavior session with the dolphins to your preference. Your Fantasy Dolphin Day includes personal, hands-on interactions. 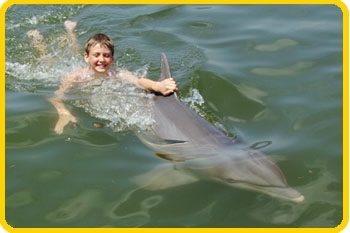 Slip into the water for the non-stop fun of a Dolphin Encounter swim with the dolphins. Experience working like a trainer with these amazing animals in a Signal Session where you’ll ask them for their spectacular behaviors and cheer their accomplishments! 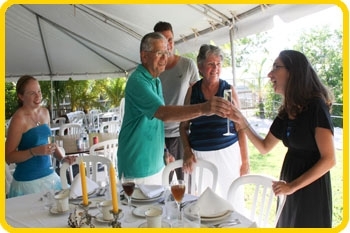 Feast on an elegant four-course dinner featuring the freshest local seafood and signature dishes prepared by a famed Florida Keys restaurant while you toast your day with wines and beer. As the brilliant sun sinks lower in the sky, the dolphins entertain you once more with a spectacular, musical Sunset Celebration. At day’s end, you’ll leave with memories that last forever, high quality pictures taken during your dolphin experiences on a commemorative CD, and the new-found friendships you made with the dolphins of DRC. 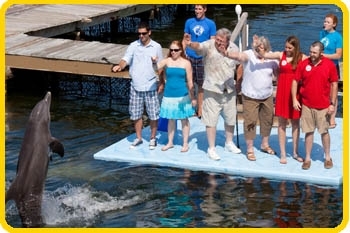 Dolphin Research Center’s Fantasy Dolphin Day is the ultimate experience for dolphin lovers and perfect for celebrating special events such as weddings, family reunions, graduations, and more. Availability is limited throughout the year. The cost of this exclusive, private experience for your group is $20,000.00 for up to 20 people. Fantasy Dolphin Day is not intended for school groups or parties with limited budgets. To discuss your plans and reserve your Fantasy Dolphin Day, please call 305-289-1121, ext. 229, Monday through Friday, 9:00 a.m. to 4:00 p.m., eastern time or email us at drc@dolphins.org. 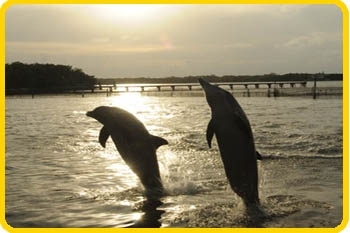 Dolphin Research Center offers many wonderful educational opportunities, such as day trips and single-night or multiple day programs for schools and youth groups. Get more informationor email our Education Department. Celebrate Special Life Moments at DRC! 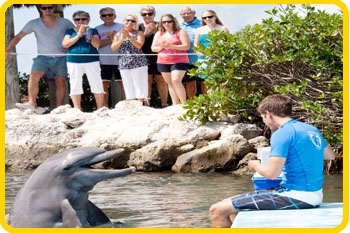 Over the years, many marriage proposals and weddings have taken place at Dolphin Research Center. We offer different options for these special moments. In-water proposals take place during a Private Dolphin Encounter. This includes an orientation with your own trainer, followed by the swim experience at a private dock with a dolphin. One of DRC's professional staff photographers will capture the event on beautiful, high-resolution digital images. The photos are included and are provided to you on a USB flash drive shortly after you complete your program. 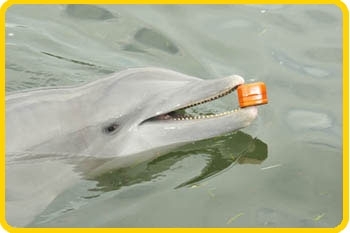 If you wish, we can even arrange for the dolphin to deliver the ring, contained in a water proof container that floats, of course. Just let us know ahead of your visit! The cost of a Private Encounter is $850.00. Up to three people can participate if you have a friend or family member observing your moment. There is no additional charge to propose marriage during this program. We require that in-water proposals take place in a private program so that the focus of the Encounter session can be completely on the couple. We also don't want to take anything away from the experience of other guests at the same dock. If you prefer to propose out of the water, there are several beautiful, scenic locations around the facility such as by the waterfall, in the Veteran's Garden, or at a small tiki hut a few feet from the Gulf of Mexico at the end of the causeway. 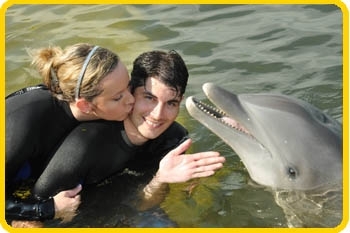 Before or after your proposal, you could participate in a public Dolphin Encounter for the cost of $199.00 per person. A photographer takes photos of you during your swim and those are available for purchase on a flash drive for an additional fee after your Encounter is complete. The cost of the photos for two people is $59.13 including tax. Imagine saying "I do" with a dolphin as your attendant! You can get married in the water during a Private Dolphin Encounter. 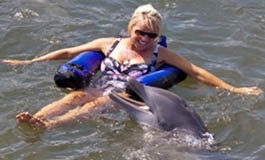 The program includes an orientation with your own trainer at a private dock with a dolphin. The bride and groom along with the person officiating then enter the water for the brief ceremony and enjoy the private swim experience. A DRC staff photographer will be on hand to capture the ceremony and the swim on beautiful, high-resolution digital images. These are included in the cost of your Private Dolphin Encounter and are provided to you on a flash drive shortly after your program completes. We require that in-water wedding ceremonies take place during a Private Encounter so that we can focus on the couple. This also ensures that nothing is taken away from the experience of other guests doing a Dolphin Encounter at the same dock. The cost of a Private Dolphin Encounter is $850 for up to three people. Additional general admission prices apply for any wedding guests who join you at DRC to observe your wedding from land. If you prefer, you can get married out of the water at one of our scenic locations such as the waterfall, in the Veterans' Garden, or at the end of the causeway overlooking the Gulf of Mexico near the end of our regular business day. If you choose this option, you can also participate in a public Dolphin Encounter earlier in the day for a cost of $199.00 per person. A flash drive of photos from your Encounter can be purchased for an additional $59.13 for two people. As with the in-water option, general admission fees apply for your other guests. Larger wedding parties, with the wedding ceremony taking place on DRC grounds after regular business hours can be accommodated. Sample itineraries and pricing are available upon request. This option requires the most planning and must be scheduled at least three months in advance with a longer lead time preferred. Please remember that scheduling and activities must be flexible and cary depending on the time of year. For example, events in late fall or early winter must take place earlier due to the earlier sunset times. For more information, or to arrange your proposal or wedding, please contact Amy at 305-289-1121, ext. 241 or via email at drc@dolphins.org. She will be happy to answer any questions and discuss your individual wishes.